Yesterday we brought you the news of racing legend Ken Block’s new Hoonigan Racing Division and the new blue paint scheme that came with the new team name and today – we get our first look at Block’s Monster Energy Drink Ford Fiesta rally car tackling the snowy backwoods of Michigan’s Sno Drift 2013. Ken Block has announced that he would be competing in the 2013 Rally America Championship in his new Hoonigan Racing Division Ford Fiesta with the first stop for his predominantly blue rally car sponsored by Monster Energy Drink and DC Shoes being the Sno Drift 2013 in south eastern Michigan. This event officially begins later today but Ken has spent the past few days out practicing on the snow covered course and with his return to American stage rally racing – he was kind enough to offer up the first video of his new race car in action. 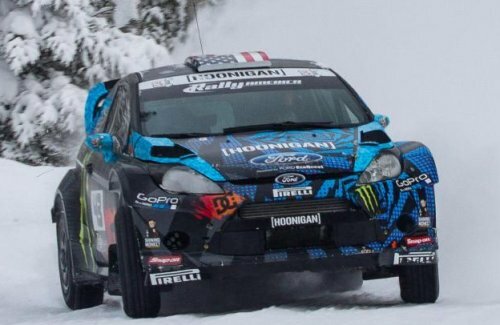 This first video of Ken Block’s new Hoonigan Racing Division Fiesta in action is short but sweet – showing the new colorful race purposed Ford Compact ripping through the snow during practice for this weekend’s Sno Drift 2013. As is the case with many of Ken’s videos, this first Hoonigan Racing Division clip includes co-pilot Alex Gelsomino and like all of the insanely popular Block videos – this new piece includes plenty of awesome slow motion shots (both inside of the car and outside), freeze frames, some background music that Ken refers to as “face melting metal” and even a few instances where the sweet engine sounds of the Monster Energy Drink Ford Fiesta overpowering the heavy metal. Normally, watching a short video of Ken Block roaring through deep snow in his Monster Energy Drink Ford Fiesta is just something fun to see but for the millions of fans of Ken Block around the world – this presents an exciting first chance to see the new paint scheme in action. Block has been using the same basic car design that was mostly white and black with Monster Energy Drink green trim all of the way back to when he was still racing around the world in Subaru products. However, with the departure from the Monster World Rally Team name and with the introduction of the Hoonigan Racing Division team came the first new look for Block in years. The look of Block’s race car and matching apparel are a big part of his legacy in the motorsports world so with this first video of the new car in action – a new era in the racing career of Ken Block for both himself and his fans begins. Click here for a closer look at Block’s new paint scheme on the HFHV competing this weekend along with his new Global RallyCross car. As this article is published a variety of racers have completed the first stage of the Sno Drift 2013 including Ken Block who turned out a stage 1 time of 6:18.1. This puts Block and Gelsomino in the second spot overall currently – trailing leader and fellow Global RallyCross racer David Higgins. Considering how active Ken Block is on the various social networking outlets, we can almost surely expect to see more videos of the new Hoonigan Racing Division Ford Fiesta in action at the Michigan Sno Drift 2013. The first round runs today and the second round runs tomorrow so by the end of the day on Saturday - we should have some results for Block fans from the first event of the 2013 Rally America Championship. In the meantime, enjoy the video below courtesy of Ken Block showing his new blue Fiesta race car in action.